This article is about Syrian opposition during the Syrian Civil War. For other historic opposition in Syria, see Syrian opposition (disambiguation). The Syrian opposition (Arabic: المعارضة السورية‎ al-Muʻaraḍatu s-Sūrīyah, [almʊˈʕaːɾadˤɑtu s.suːˈɾɪj.ja]) is an umbrella term for the political structure represented by the Syrian National Coalition and associated anti-government Syrian groups with certain territorial control in the form of a proto-state as an alternative Syrian government, claiming to be the legitimate Syrian Arab Republic and also sometimes known just as the Republic of Syria. The Syrian opposition evolved since the beginning of the Syrian conflict from groups calling for the overthrow of the Assad government in Syria and who have opposed its Ba'athist government. Prior to the Syrian Civil War, the term "opposition" (Arabic: المعارضة‎) had been used to refer to traditional political actors, for example the National Coordination Committee for Democratic Change; that is, groups and individuals who have had a history of dissidence against the Syrian state. The first opposition structures to form in the Syrian uprising were local protest-organizing committees. These formed in April 2011, as protesters graduated from spontaneous protests to protests organized by meetings beforehand. "The core of the grassroots civil opposition is the youth, mainly from the working and middle-classes, in which women and diverse religious and ethnic groups play active roles. Many of these activists remain non-affiliated to traditional political ideologies but are motivated by concerns for freedom, dignity, social justice and basic human rights." The Syrian uprising phase, from March 2011 until the start of August 2011, was characterized by a consensus for nonviolent struggle among the uprising's participants. Thus the conflict could not have been yet characterized as a "civil war", until the organization of armed struggle began on the anti-government side. This occurred beginning from 29 July 2011, allowing the conflict to meet the international political definition of "civil war." Opposition groups in Syria took a new turn in late 2011, during the Syrian Civil War, as they united to form the Syrian National Council (SNC), which has received significant international support and recognition as a partner for dialogue. The Syrian National Council was recognized or supported in some capacity by at least 17 member states of the United Nations, with three of those (France, United Kingdom and the United States) being permanent members of the Security Council. A broader opposition umbrella group, the National Coalition for Syrian Revolutionary and Opposition Forces, was formed in November 2012 and has gained recognition as the "legitimate representative of the Syrian people" by the Cooperation Council for the Arab States of the Gulf (CCASG) and as a "representative of aspirations of Syrian people" by the Arab League. The Syrian National Coalition was subsequently given the seat of Syria in the Arab League, with The Syrian Government representative suspended. The Syrian National Council, initially a part of the Syrian National Coalition, withdrew on 20 January 2014 in protest at the decision of the coalition to attend the Geneva talks. Despite tensions, the Syrian National Council retains a degree of ties with the National Coalition for Syrian Revolutionary and Opposition Forces. Syrian opposition groups held reconciliation talks in Astana, Kazakhstan in October 2015. Syria has been a independent republic since 1946 after the expulsion of the French forces. For decades, the country was partially stable with a series of coups until the Ba'ath Party seized power in Syria in 1963 after a coup d'état. The head of state since 1971 has been a member of the al-Assad family, beginning with Hafez al-Assad (1971–2000). Syria was under emergency law from the time of the 1963 Syrian coup d'état until 21 April 2011, when it was rescinded by Bashar al-Assad, Hafez's eldest surviving son and the current President of Syria. As the revolutionary wave commonly referred to as the Arab Spring began to take shape in early 2011, Syrian protesters began consolidating opposition councils. The Istanbul Meeting for Syria, the first convention of the Syrian opposition, took place on 26 April 2011, during the Syrian civil uprising. There followed the Antalya Conference for Change in Syria or Antalya Opposition Conference, a three-day conference of representatives of the Syrian opposition held from 31 May until 3 June 2011 in Antalya, Turkey. Organized by Ammar al-Qurabi's National Organization for Human Rights in Syria and financed by the wealthy Damascene Sanqar family, it led to a final statement refusing compromise or reform solutions, and to the election of a 31-member leadership. After the Antalya conference, a follow-up meeting took place two days later in Brussels, then another gathering in Paris that was addressed by Bernard Henri Levy. It took a number of further meetings in Istanbul and Doha before yet another meeting on 23 August 2011 in Istanbul set up a permanent transitional council in form of the Syrian National Council. Salafist groups such as Al-Nusra Front. Official logo of the National Coalition for Syrian Revolutionary and Opposition Forces. The National Coalition for Syrian Revolutionary and Opposition Forces is a coalition of opposition groups and individuals, mostly exilic, who support the Syrian revolution side and oppose the Assad government ruling Syria. It formed on 11 November 2012 at a conference of opposition groups and individuals held in Doha, Qatar. It has relations with other opposition organizations such as the Syrian National Council, the previous iteration of an exilic political body attempting to represent the grassroots movement; the union of the two was planned,[by whom?] but has failed to realize. Moderate Islamic preacher Moaz al-Khatib, who had protested on the Syrian street in the early nonviolent phase of the uprising, served a term as the president of the coalition, but soon resigned his post, frustrated with the gap between the body and the grassroots of the uprising inside Syria. Riad Seif and Suheir Atassi, both of whom had also protested on the street in Syria early in the uprising, were elected as vice presidents. Mustafa Sabbagh is the coalition's secretary-general. the Assyrian Democratic Organization: a party representing Assyrians in Syria and long repressed by the Assad government, it has participated in opposition structures since the beginning of the conflict. Abdul-Ahad Astepho is a member of the SNC. The Syrian National Council (al-Majlis al-Waṭanī as-Sūri) sometimes known as SNC, the Syrian National Transitional Council or the National Council of Syria, is a Syrian opposition coalition, based in Istanbul (Turkey), formed in August 2011 during the Syrian civil uprising against the government of Bashar al-Assad. Initially, the council denied seeking to play the role of a government in exile, but this changed a few months later when violence in Syria intensified. The Syrian National Council seeks the end of Bashar al-Assad's rule and the establishment of a modern, civil, democratic state. The SNC National Charter lists human rights, judicial independence, press freedom, democracy and political pluralism as its guiding principles. In November 2012 the Council agreed to unite with several other opposition groups to form the National Coalition for Syrian Revolutionary and Opposition Forces, with the SNC having 22 out of 60 seats. The Council withdrew from the Coalition on 20 January 2014 in protest at the decision of the Coalition to attend talks in Geneva. the Syrian Democratic People's Party, a socialist party which played a "key role" in forming the SNC. The Party's leader George Sabra (a secularist born into a Christian family) is the official spokesman of the SNC, and also ran for chairman. the Supreme Council of the Syrian Revolution, a Syrian opposition group supporting the overthrow of Bashar al-Assad's government. It grants local opposition groups representation in its national organization. the Syrian Democratic Turkmen Movement: An opposition party, constituted in Istanbul on 21 March 2012, of Syrian Turkmens. Ziyad Hasan leads the Syrian Democratic Turkmen Movement. The National Coordination Committee for Democratic Change (NCC), or National Coordination Body for Democratic Change (NCB), is a Syrian bloc chaired by Hassan Abdel Azim and consisting of 13 left-wing political parties and "independent political and youth activists". Reuters has defined the Committee as the internal opposition's main umbrella group. The NCC initially had several Kurdish political parties as members, but all except for the Democratic Union Party left in October 2011 to join the Kurdish National Council. Some opposition activists[who?] have accused the NCC of being a "front organization" for Bashar al-Assad's government and have denounced some of its members as ex-government insiders. The NCC's generally has poor relationships with other Syrian political opposition groups. The Syrian Revolution General Commission, the Local Coordination Committees of Syria or[clarification needed] the Supreme Council of the Syrian Revolution oppose the NCC calls to dialogue with the Syrian government. In September 2012 the Syrian National Council (SNC) reaffirmed that despite broadening its membership, it would not join with "currents close to [the] NCC". Despite the NCC recognizing the Free Syrian Army (FSA) on 23 September 2012, the FSA has dismissed the NCC as an extension of the government, stating that "this opposition is just the other face of the same coin". the Syriac Union Party, a party representing the interests of Syriac Christians and affiliated with the Syriac Union Party in Lebanon (itself part of the anti-Assad March 14 Alliance). It has taken part in numerous opposition demonstrations, including storming the Syrian embassy in Stockholm in August 2012. It later[when?] left the NCC and joined the Syrian Democratic Council in late 2015.
the Democratic Union Party, the main Kurdish party in Syria and the dominant party in the de facto Democratic Federation of Northern Syria. It later[when?] left the NCC and joined the Syrian Democratic Council in late 2015. The Syrian Democratic Council was established on 10 December 2015 in al-Malikiyah. It was co-founded by prominent human rights activist Haytham Manna and was intended as the political wing of the Syrian Democratic Forces. The council includes more than a dozen blocs and coalitions that support federalism in Syria, including the Movement for a Democratic Society, the Kurdish National Alliance in Syria, the Law–Citizenship–Rights Movement, and since September 2016 the Syria's Tomorrow Movement. The last group is led by former National Coalition president and Syrian National Council Ahmad Jarba. In August 2016 the SDC opened a public office in al-Hasakah. The Syrian Democratic Council is considered an "alternative opposition" bloc. Its leaders included former NCC members such as Riad Darar, a "key figure" in the Syrian opposition, and Haytham Manna, who resigned from the SDC in March 2016 in protest of its announcement of the Northern Syria Federation. The SDC was rejected by some other opposition groups due to its system of federalism. The Syrian Democratic Council was invited to participate in the international Geneva III peace talks on Syria in March 2016. However, it rejected the invitations because no representatives of the Movement for a Democratic Society, led by the Democratic Union Party, were invited. Muslim Brotherhood: Islamist party founded in 1930. The brotherhood was behind the Islamic uprising in Syria between 1976 until 1982. The party is banned in Syria and membership became a capital offence in 1980. The Muslim Brotherhood has issued statements of support for the Syrian uprising. Other sources have described the group as having "risen from the ashes", "resurrected itself" to be a dominant force in the uprising. The Muslim Brotherhood has constantly lost influence with militants on the ground, who have defected from the Brotherhood affiliated Shields of the Revolution Council to the Islamic Front. Coalition of Secular and Democratic Syrians: nucleus of a Syrian secular and democratic opposition that appeared during the Syrian civil war. It came about through the union of a dozen Muslim and Christian, Arab and Kurd parties, who called the minorities of Syria to support the fight against the government of Bashar al-Assad. The Coalition has also called for military intervention in Syria, under the form of a no-fly zone similar to that of Kosovo, with a safe zone and cities. The president of the coalition, who is also a member of the SNC, is Randa Kassis. Syrian Turkmen Assembly: A recently formed assembly of Syrian Turkmens which constitutes a coalition of Turkmen parties and groups in Syria. It is against the partition of Syria after the collapse of Baath government. The common decision of Syrian Turkmen Assembly is: "Regardless of any ethnic or religious identity, a future in which everybody can be able to live commonly under the identity of Syrian is targeted in the future of Syria." Syrian Turkmen National Bloc: An opposition party of Syrian Turkmens, which was founded in February 2012. The chairman of the political party is Yusuf Molla. Local Coordination Committees of Syria: Network of local protest groups that organise and report on protests as part of the Syrian civil war, founded in 2011. 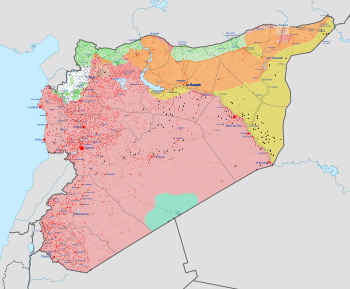 As of August 2011[update], the network supported civil disobedience and opposed local armed resistance and international military intervention as methods of opposing the Syrian government. Key people are activists Razan Zaitouneh and Suhair al-Atassi. Syrian National Democratic Council: formed in Paris on 13 November 2011 during the Syrian civil war by Rifaat al-Assad, uncle of Bashar al-Assad. Rifaat al-Assad has expressed the wish to replace Bashar al-Assad with the authoritarian state apparatus intact, and to guarantee the safety of government members, while also making vague allusions to a "transition". Rifaat has his own political organisation, the United National Democratic Rally. Syrian Revolution General Commission: Syrian coalition of 40 Syrian opposition groups to unite their efforts during the Syrian civil war that was announced[by whom?] on 19 August 2011 in Istanbul. At a conference held in Istanbul on 19 March 2013, members of the National Coalition elected Ghassan Hitto as prime minister of an interim government for Syria. Hitto has announced that a technical government will be formed which will be led by between 10 and 12 ministers. The minister of defense is to be chosen by the Free Syrian Army. The SIG is based in Turkey. It has been the primary civilian authority throughout most of opposition-held Syria. Its system of administrative local councils operate services such as schools and hospitals in these areas, as well as the Free Aleppo University. By late 2017, it presided over 12 provincial councils and over 400 elected local councils. It also operates a major border crossing between Syria and Turkey, which generates an estimated $1 million revenue each month. It is internationally recognized by the European Union and the United States, among others. It maintains diplomatic ties with some non-FSA rebel groups, such as Ahrar al-Sham but is in conflict with the more extreme Tahrir al-Sham, which is one of the largest armed groups in Idlib Governorate. The Syrian Salvation Government is an alternative government of the Syrian opposition seated within Idlib Governorate, which was formed by the General Syrian Conference in September 2017. The domestic group has appointed Mohammed al-Sheikh as head of the Government with 11 more ministers for Interior, Justice, Endowment, Higher Education, Education, Health, Agriculture, Economy, Social Affairs and Displaced, Housing and Reconstruction and Local Administration and Services. Al-Sheikh, in a press conference held at the Bab al-Hawa Border Crossing has also announced the formation of four commissions: Inspection Authority, Prisoners and missing Affairs, Planning and Statistics Authority, and the Union of Trade Unions. The founder of the Free Syrian Army, Col. Riad al-Asaad, was appointed as deputy prime minister for military affairs. The SSG is associated with Hay'at Tahrir al-Sham (HTS) and not recognised by the rest of the opposition, which is in conflict with HTS. There is a sharp ideological divide between the two competing opposition civil authorities: The SIG espouses secular, moderate values and regularly participates in international peace talks; the SSG enforces a strict interpretation of Islamic law and stringently rejects talks with the Syrian regime. In April 2015, after the Second Battle of Idlib, the interim seat of the Syrian Interim Government was proposed to be Idlib, in the Idlib Governorate. However, this move was rejected by the al-Nusra Front and Ahrar al-Sham-led Army of Conquest, which between them controlled Idlib. According to the Syrian National Coalition, in 2017 there were 404 opposition-aligned local councils operating in villages, towns, and cities controlled by rebel forces. In 2016, the Syrian Interim Government became established within the Turkish occupied areas. The Salvation Government extends authority mostly in the Idlib Governorate. The foreign relations of the Syrian Opposition refers to the external relations of the self-proclaimed oppositional Syrian Arab Republic, which sees itself as the genuine Syria. The region of control of Syrian opposition affiliated groups is not well defined. The Turkish government recognizes Syrian opposition as the genuine Syrian Arab Republic and hosts several of its institutions on its territory. The seat of Syria in the Arab League is reserved for the Syrian opposition since 2014, but not populated. Initially, the Free Syrian Army was perceived as the ultimate military force of the Syrian Opposition, but with the collapse of many FSA factions and emergence of powerful Islamist groups, it became clear to the opposition that only a cooperation of secular military forces and moderate Islamists could form a sufficient coalition to battle both the Syrian Government forces and radical Jihadists such as ISIL and in some cases al-Nusra Front. Free Syrian Army: Paramilitary that has been active during the Syrian civil war. Composed mainly of defected Syrian Armed Forces personnel, its formation was announced on 29 July 2011 in a video released on the Internet by a uniformed group of deserters from the Syrian military who called upon members of the Syrian army to defect and join them. The leader of the group, who identified himself as Colonel Riad al-Asaad, announced that the Free Syrian Army would work with demonstrators to bring down the system, and declared that all security forces attacking civilians are justified targets. It has also been reported that many former Syrian Consulates are trying to band together a Free Syrian Navy from fishermen and defectors to secure the coast. Syrian Turkmen Brigades: An armed opposition structure of Syrian Turkmens fighting against Syrian Armed Forces. It is also the military wing of Syrian Turkmen Assembly. It is led by Colonel Muhammad Awad and Ali Basher. Islamic Front: An Islamist rebel group formed in November 2013 and led by Ahrar al-Sham. It was always a loose alliance and was defunct by 2015. Syrian Islamic Liberation Front: The major rebel fighting coalition independent of the FSA in the period 2012-2013, including the moderate Islamist groups Suqour al-Sham, Al-Tawhid Brigade and Jaysh al-Islam, deploying up to half the opposition's fighting force. It main members joined the Islamic Front in 2013. Turkish-backed Free Syrian Army: A coalition of mainly Arab and Turkmen opposition fighters in Northern Syria, armed and backed by Turkey since May 2017, partially reorganized as the Syrian National Army in December 2017. National Front for Liberation: A coalition of FSA groups in Idlib and NW Syria formed in early 2018 and backed by Turkey. Syrian Liberation Front: An Islamist rebel group formed in early 2018 and including Ahrar al-Sham and the Nour al-Din al-Zenki Movement, the largest rebel fighting groups in NW Syria. Abdulrazak Eid, Syrian writer and thinker, participated in finding the Committees for the Civil Society in Syria, wrote the first draft of the Statement of 1000, and participated in drafting the Damascus Declaration, president of the national council of Damascus Declaration abroad. Ammar Abdulhamid, leading Human-Rights Advocate, Founder of Tharwa Foundation, first Syrian to testify in front of American Congress 2006/2008, briefed Presidents of the United States, and called for Syria Revolution in 2006. Michel Kilo, Christian writer and human rights activist, who has been called "one of Syria's leading opposition thinkers"
Samar Yazbek, Syrian author and journalist. She was awarded the 2012 PEN Pinter International Writer of Courage Award for her book, A Woman in the Crossfire: Diaries of the Syrian Revolution. She fled Syria in 2011 but continues to be an outspoken critic of the al-Assad government from abroad, from Europe and the US. ^ admin-1. "بيان من الحكومة السورية المؤقتة بمناسبة تحرير ادلب". syriaig.org. Archived from the original on 1 April 2015. ^ al-Khateb, Khaled (15 March 2019). "Is this the end of the Syrian Interim Government?". Al-Monitor. Retrieved 15 March 2019. ^ "The main components of the Syrian opposition". London: BBC Arabic. 24 February 2012. Retrieved 1 September 2013. ^ thejournal.ie (27 February 2012). "EU ministers recognise Syrian National Council as legitimate representatives". Retrieved 29 February 2012. ^ Andrew Rettman (24 October 2011). "France recognises Syrian council, proposes military intervention". EUObserwer. Retrieved 24 November 2011. ^ "Clinton to Syrian opposition: Ousting al-Assad is only first step in transition". CNN. 6 December 2011. ^ "UK Recognizes Syrian Opposition". International Business Times. 24 February 2012. Retrieved 29 February 2012. ^ "Libya NTC says recognises Syrian National Council". Khaleej Times. 11 October 2011. Retrieved 10 October 2011. ^ "Libya to arm syrian rebels". The Sydney Morning Herald. Sydney Morning Herald. 27 November 2011. Retrieved 8 August 2013. ^ "Syria's newly-formed opposition coalition draws mixed reaction". Xinhua. 13 November 2012. Retrieved 25 January 2013. ^ "Main bloc quits Syrian National Coalition over Geneva". The Times of Israel. 21 January 2014. Retrieved 20 January 2014. ^ "Syrian opposition sign joint document in Kazakhstan's Astana". Tengri News. ^ Syria's state of emergency, Al Jazeera, 17 April 2011. ^ Samir Aita (2015). "Syria". In I. William Zartman (ed.). Arab Spring: Negotiating in the Shadow of the Intifadat. Athens, Georgia: University of Georgia Press. p. 302 f. ISBN 978-0-8203-4824-7. ^ Ufuk Ulutaş (2011). "The Syrian Opposition in the Making: Capabilities and Limits". Insight Turkey. 13 (3): 92. ^ a b "Syrian opposition seeks unified front at Riyadh conference". 8 December 2015 – via www.bbc.com. ^ Kahf, Mohja. "Lack of U.S. Peace Movement Solidarity with Syrian Uprising and the "No Good Guys Excuse" | Fellowship of Reconciliation". Forusa.org. Archived from the original on 22 April 2014. Retrieved 21 January 2014. ^ Rebhy, Abdullah (11 November 2012). "Syrian opposition groups reach unity deal". Associated Press. Archived from the original on 28 November 2012. Retrieved 11 November 2012. ^ "Carnegie Middle East Center: The Assyrian Democratic Organization". Carnegie Middle East Center. Retrieved 26 October 2014. ^ "Assyrians and the Syrian Uprising". Retrieved 26 October 2014. ^ Skelton, Charlie (12 July 2012). "The Syrian opposition: who's doing the talking?". London: The Guardian. Retrieved 14 July 2012. ^ the CNN Wire Staff (23 August 2011). "Syrian activists form a 'national council'". CNN. Retrieved 24 August 2011. ^ "Arab League under pressure, resists freezing Syria membership". Al Ahram. 12 November 2011. Retrieved 21 December 2011. ^ Yezdani, İpek (23 August 2011). "Syrian dissidents form national council". The Edmond Sun. Archived from the original on 4 December 2012. Retrieved 19 November 2011. ^ "Syrian council wants recognition as voice of opposition". Reuters. 10 October 2011. Retrieved 19 November 2011. ^ "Syrian National Council, Syria's rebel government, opens offices in Turkey". Global Post. 15 December 2011. Retrieved 21 December 2011. ^ "Syrian National Council Holds First Congress in Tunis". Tunisia Live. 16 December 2011. Archived from the original on 8 January 2012. Retrieved 21 December 2011. ^ "Why Syria's Kurds Will Determine the Fate of the Revolution". IKJNEWS. 15 December 2011. Archived from the original on 26 April 2012. Retrieved 21 December 2011. ^ "Q&A: Syrian opposition alliance". BBC News. 16 November 2011. ^ AP 4:15 p.m. EST 11 November 2012 (11 November 2012). "Syrian opposition groups reach unity deal". Usatoday.com. Retrieved 4 January 2014. ^ "Syrian opposition groups sign coalition deal - Middle East". Al Jazeera English. Retrieved 4 January 2014. ^ Gamal, Rania El (11 November 2012). "Syrian opposition agrees deal, chooses preacher as leader". Reuters. Retrieved 4 January 2014. ^ "Carnegie Middle East Center: The Syrian Democratic People's Party". Carnegie Middle East Center. Retrieved 26 October 2014. ^ "Carnegie Middle East Center: George Sabra". Carnegie Middle East Center. Retrieved 26 October 2014. ^ Haddad, Bassam (30 June 2012). "The Current Impasse in Syria: Interview with Haytham Manna". Jadaliyya. Archived from the original on 26 November 2012. Retrieved 26 November 2012. ^ "Guide to the Syrian opposition". BBC News. 25 July 2012. Retrieved 13 November 2011. ^ a b "Damascus meeting calls for peaceful change in Syria". Reuters UK. 23 September 2012. Archived from the original on 3 October 2012. Retrieved 23 September 2012. ^ "National Coordination Body for Democratic Change". Carnegie Middle East Center. Retrieved 11 September 2012. ^ "Syria opposition groups fail to reach accord". Financial Times. 4 January 2012. Retrieved 16 August 2012. ^ "Meet Syria's Opposition". Foreign Policy. 1 November 2011. Retrieved 13 November 2011. ^ "Syria's opposition SNC to expand, reform". AFP. 2 September 2012. Retrieved 2 September 2012. ^ "Syria Salvation Conference: Our Main Principles". NCC/NCB official statement. 23 September 2012. Archived from the original on 26 September 2012. Retrieved 24 September 2012. ^ a b "Kurdish-Arab coalition fighting Islamic State in Syria creates political wing". GlobalPost (AFP). 10 December 2015. Retrieved 26 May 2016. ^ "Inauguration of the 1st MSD office". Hawar News Agency. 1 August 2016. Archived from the original on 4 August 2016. Retrieved 3 August 2016. ^ "Haytham Manna Elected Joint Chairman of Syrian Democratic Council". Syrian Observer. 14 December 2015. ^ "Syrian opposition co-leader speaks about Kurdish-Baathist party relations". Rudaw. 28 April 2017. ^ Yousif Ismael (13 February 2017). "Interview with Ilham Ahmad Co-chair of Syria Democratic Council (MSD)". Washington Kurdish Institute. ^ "Muslim Brotherhood Behind Syrian Uprising". The Stafford Voice. Beirut. AP. 29 April 2011. Retrieved 25 January 2013. ^ Ghosh, Palash (11 April 2011). "Outlawed Muslim Brotherhood supports Syrian revolt". International Business Times. Retrieved 25 January 2013. ^ "Free Article for Non-Subscriber". Stratfor. 27 February 2012. Retrieved 21 January 2014. ^ Masi, Alessandria (9 March 2015). "Aleppo Battle: Al Qaeda's Jabhat Al-Nusra is Friend To Syrian Rebel Groups". International Business Times. Retrieved 10 March 2015. In 2013, the Syrian opposition included a large number of Islamist brigades that were neither moderate nor jihadist but were aligned with the Syrian Muslim Brotherhood, under an umbrella organization called the Commission of the Shields of the Revolution. Two years later, the brigades have begun to slowly disperse. ^ John Irish (16 September 2011) "France hails Syria council, develops contacts", Reuters. ^ "Les partis d'opposition laïcs syriens unissent leurs forces à Paris", Agence France-Presse, 18 September 2011. ^ "UN: Syria death toll tops 2,700", Al Jazeera, 19 September 2011. ^ "Répression en Syrie: Al Assad seul contre tous ?" Archived 15 January 2012 at the Wayback Machine, France 24, 11 January 2012. ^ "Entretien avec Randa Kassis, opposante et intellectuelle syrienne porte-parole de la Coalition des Forces Laïques et membre du Conseil National Syrien", France Soir, 11 November 2011. ^ Alexandre Del Valle (2 June 2011) "Syrie: Pourquoi Assad reste au pouvoir", France Soir. ^ Julien Peyron (11 January 2012) Discours de Bachar al-Assad: "Comme d’habitude, il ressort le complot de l’étranger", France 24. ^ "Randa Kassis est membre du comité directeur de la Coalition des forces laïques et démocratiques syriennes." Archived 12 February 2012 at the Wayback Machine, Radio France International, 18 September 2011. ^ Syrian Turkmens ask equality in opposition, Hürriyet Daily News, 17 December 2012, Istanbul. ^ "Syrian woman activist wins human rights award". Amnesty International. 7 October 2011. Archived from the original on 5 February 2012. Retrieved 5 January 2012. ^ Basil, Yousuf; Richard Roth; Mick Krever; Salma Abdelaziz; Mohamed Fadel Fahmy (5 February 2012). "Opposition group calls for strike as Syrian violence grows". CNN. Archived from the original on 5 February 2012. Retrieved 5 February 2012. ^ "Syrian Local Coordinating Committees on Taking Up Arms and Foreign Intervention". Jadaliyya. Arab Studies Institute. 31 August 2011. Archived from the original on 5 February 2012. Retrieved 5 February 2012. ^ Shadid, Anthony; Hwaida Saad (30 June 2011). "Coalition of Factions From the Streets Fuels a New Opposition in Syria". The New York Times. Archived from the original on 5 February 2012. Retrieved 5 February 2012. ^ "Exiled Assad's uncle wants to lead Syria transition". Al Arabiya. 14 November 2011. Retrieved 15 August 2012. ^ "United National Democratic Rally التجمع القومي الديموقراطي الموحد". Retrieved 26 October 2014. ^ "Syrian coalition against Assad formed". Dawn. Agence France-Presse. 19 August 2011. Retrieved 25 August 2011. ^ "Syrian rebels to choose interim defence minister | Middle East". World Bulletin. 29 March 2013. Retrieved 9 September 2013. ^ a b c d "HTS-backed civil authority moves against rivals in latest power grab in northwest Syria". Syria Direct. 13 December 2017. Retrieved 14 November 2018. ^ "A power struggle over education emerges between rival opposition governments in Idlib province". Syria Direct. 10 January 2018. Retrieved 14 November 2018. ^ "The Syrian General Conference Faces the Interim Government in Idlib". Enab Baladi. 18 September 2017. Retrieved 13 December 2017. ^ a b Enab Baladi Online (opposition website) (9 November 2017). "Who Will Lead Idleb's New 'Salvation Government?'". The Syrian Observer. Retrieved 13 November 2018. ^ "Will Syrian opposition move interim government to Idlib? - Al-Monitor: the Pulse of the Middle East". Al-Monitor. 7 April 2015. Archived from the original on 26 December 2016. ^ Anton Mardasov (20 February 2017). "Why Moscow now sees value in Syrian local councils". Al-Monitor: the Pulse of the Middle East. ^ Albayrak, Ayla (4 October 2011). "Turkey Plans Military Exercise on Syrian Border". Wall Street Journal. Retrieved 4 October 2011. ^ "Syria Army Defectors Press Conference – 9–23–11". Syria2011archives. Retrieved 9 October 2011. ^ 1 week with the "free syrian army" – February 2012 – Arte reportage 1 of 2. YouTube. Retrieved on 23 March 2012. ^ Landis, Joshua (29 July 2011). "Free Syrian Army Founded by Seven Officers to Fight the Syrian Army". Syria Comment. Retrieved 7 August 2011. ^ "Defecting troops form 'Free Syrian Army', target Assad security forces". World Tribune. 3 August 2011. Archived from the original on 27 November 2011. Retrieved 7 August 2011. ^ "Syrian Army Colonel Defects forms Free Syrian Army". Asharq Alawsat. 1 August 2011. Archived from the original on 29 September 2011. Retrieved 7 August 2011. ^ "Former Syrian Consulates Support Free Syrian Navy". ^ "Leading Syrian rebel groups form new Islamic Front". BBC. 22 November 2013. Retrieved 20 January 2014. ^ Aron Lund (23 March 2015). "Islamist Mergers in Syria: Ahrar al-Sham Swallows Suqour al-Sham". Carnegie Middle East Center. Retrieved 13 November 2018. ^ "Our Team". Foundation for defense of democracies. Archived from the original on 22 September 2012. Retrieved 25 January 2013. ^ Wright, Robin (2008). Dreams and Shadows: The Future of the Middle East. New York: Penguin Press. p. 232. ISBN 978-1-59420-111-0 .